Thailand’s cities are highly vulnerable to the impacts of climate change and are already struggling to deal with these impacts. Making urban areas like Bangkok as safe and resilient as possible must be a policy priority for local and national governments. 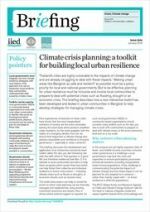 But to be effective, planning for urban resilience must be inclusive and involve local communities to prepare to deal with potential crises such as flooding, drought or an economic crisis. This briefing describes how a new interactive toolkit has been developed and tested in urban communities in Bangkok to help develop strategies for managing climate crises.